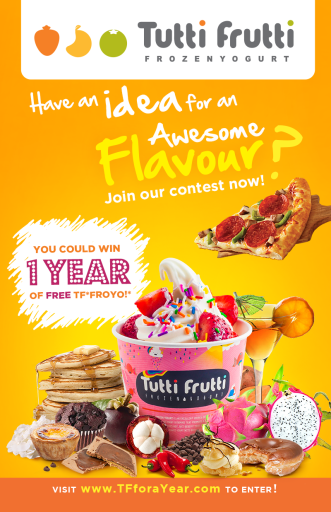 Win Tutti Frutti For a Year! THE Greatest Flavour EVER! Contest! We looking to our fans for help to create the greatest flavour EVER! Win a year’s worth of Tutti Frutti Frozen Yogurt Froyo! and a flavour named after you! 1. Search for the contest post on Facebook or Instagram – Repost and hashtag #TFforaYear with your flavour idea. 2. Fill out the form below to Enter to Win! Our team will then hand pick the top 5 great flavour choices from all our entries. We will leave the winning flavour choice up to you.. Our fans will have a chance to Vote for the Greatest Flavour choice through our online poll. Once a winning flavour is chosen, It will be named after YOU and Tutti Frutti Frozen Yogurt will be swirling your feature flavour at select locations for a minimum one week period across Canada. Winner will receive, bragging rights, their name next to the winning flavour to be posted in store and online + the grand prize of a years worth of Tutti Frutti Frozen Yogurt ( Valued at $500 ).